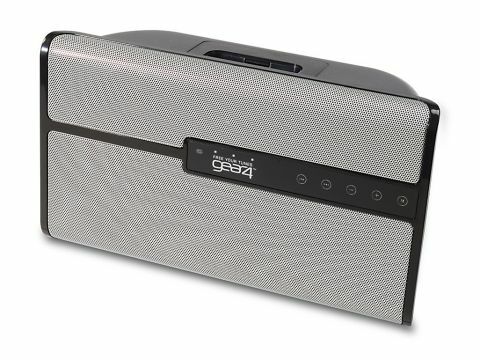 Gear4's HouseParty Blu is the latest in its HouseParty line-up, and it has the ability to stream music from A2DP-compatible Bluetooth devices in addition to slotting iPods into the dock on its top panel. As Gear4's kit goes this is quite a chunky offering - behind the grille on the front-facing part of the speaker is a deep bay that holds the 30W speakers. As you might expect, it can produce pretty high volumes. But noise isn't everything, and there are a few shortfalls with the Blu. Firstly, this is a strongly industrial design for what is essentially a domestic entertainment centre - it's a lump of spaceship that sticks out like a sore thumb in a cosy setting. We're definitely not design snobs, but this block of tech seems singularly unappealing. Admittedly, that might not deter buyers looking for oomph rather than panache, but the sound quality could. The bass is rather loose and overbearing; Hey Mama by The Black Eyed Peas lost its overproduced poppy brightness in an instant. The rest of the audio profile is acceptable if you're not too discerning but for us, after being swamped with iPod speakers for years, it's not really that engaging. A few things annoyed us about the onboard buttons too. For a start, there's no Play button - you can only start the track from the iPod by either touching the iPod or using the remote. There's no volume indicator, so you don't know how loud the music is going to start playing back. The only indication is the iPod's volume bar, but how much is that going to be amplified? Thirdly, there's no LED or LCD screen to show you the name of the song arriving from the Bluetooth device. We've seen some online write-ups that seemed to praise the HouseParty Blu. Sadly, we didn't come to the same conclusion. Yes, all the functions work as advertised, but it's really rather lacklustre and unappealing, sacrificing volume for quality.